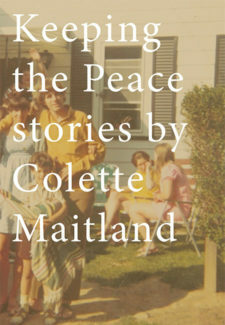 Colette Maitland has been writing short stories since her youngest son entered kindergarten in 1996. She has published widely in literary magazines – The Antigonish Review, Pottersfield Portfolio, Descant, Room of One’s Own, The Nashwaak Review, Wascana Review, The Prairie Journal, Freefall, The Puritan, The Fiddlehead, Event and frequently in The New Quarterly. She has also collected a few first place finishes in literary competitions: The Kingston Literary Awards (1998), The WFNB Literary Competition (2006), and The CAA Niagara Branch “Ten Stories High” Short Story Competition (2007). In addition, she was a finalist for the Writers’ Union of Canada 10th Annual Postcard Story Contest (2009), and in 2010, she was short-listed for the Metcalf-Rooke Award. Colette is a mother of four grown children, and grandmother to Laura and Rachel. She lives in Gananoque, ON with her husband of thirty-one years, Al Maitland.